Physiotherapist Charissa Fermelis shares some advice for managing this common joint condition through movement. Osteoarthritis is a degenerative joint disease, where the cartilage protecting bones breaks down, exposing the ends of the bones and leading to pain, stiffness and swelling. It’s the most common joint disease affecting Australian adults, and most often impacts the knees, hips and hands. 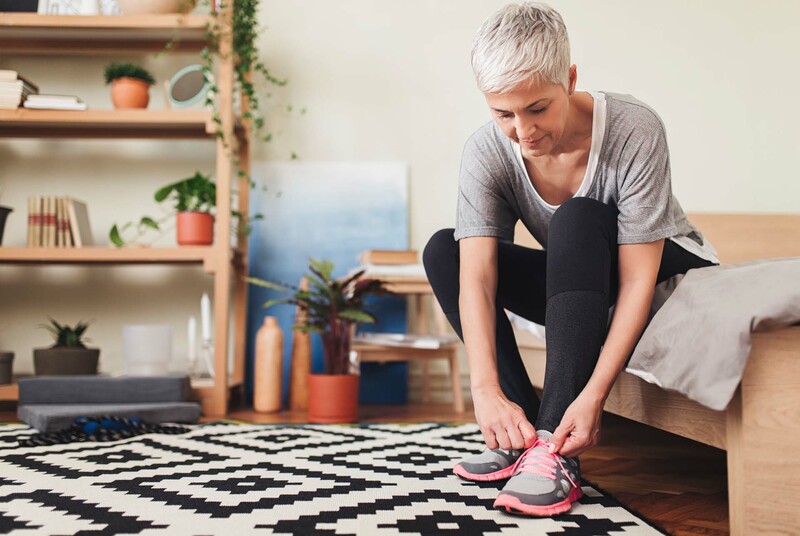 Symptoms of osteoarthritis are often worst in the mornings, during or after exercise, after sitting or standing for long periods, or at the end of the day. These symptoms usually start off mild, but worsen over time. Osteoarthritis can significantly affect the weight bearing joints of the legs, so doing regular exercise to keep the large muscles of the legs strong and flexible is essential. Just keep in mind that any exercise you do should not aggravate your symptoms! Here are a few activities to try. "Focuses of your workout should ideally include abdominal and lower limb muscle strength and joint mobility, pelvic stability, leg alignment and balance." Exercise programs aimed at strengthening the calves, quadriceps, hamstrings, gluteals and abdominals are ideal for supporting and decompressing the joints. Most community centres and gyms provide group exercise classes for active adults, which also provide social benefits. Gyms also generally offer a complementary personal weights and training program upon joining. If you have a personal trainer, work on strengthening isolated muscle groups, as well as functional movements. Pilates exercises are versatile and easily modified, so they’re ideal for people with osteoarthritis. However, like any mode of exercise, it must be practised correctly to ensure safety and effectiveness. Focuses of your workout should ideally include abdominal and lower limb muscle strength and joint mobility, pelvic stability, leg alignment and balance. You can do group Pilates in a studio or gym, or work privately with a physiotherapist who uses Pilates as part of their practice. Hydrotherapy is great – the buoyancy helps to decompress the joints, the hydrostatic effect of the water on the limbs reduces swelling, and the water provides continual resistance for muscle strengthening. Activities and movements are often easier when performed in water, which makes you feel good. Remember when you used to do handstands in the pool as a kid? "Think of your skeleton like the timber frame in a single storey house – the frame can only support a certain amount of weight." Another effective strategy for managing osteoarthritis is weight management. Think of your skeleton like the timber frame in a single storey house – the frame can only support a certain amount of weight. If you add an extra storey the original frame will buckle under the pressure. If you're carrying extra weight, your joints will be over-compressed and more likely to degenerate. If you think you might be overweight, ask your GP to refer you to a dietitian. A dietitian will ensure you're eating the right amount of the right foods, and help you set measurable, achievable goals for reaching a healthy weight for managing osteoarthritis.